Factory Lady Rolex Datejust 26mm Diamond Bezel 18K Yellow Gold Mint!! Factory Ladies Datejust or President Diamond Bezel 18K Yellow Gold. 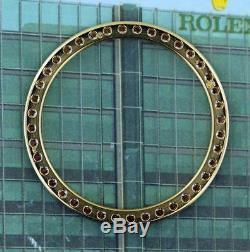 Type: Factory Rolex's Bezel. NOTE: This is an original Pre-Owned Rolex's Diamond Bezel in excellent condition. 6916, 6917, 6927, 69136, 69163, 69173, 69174, 69178, 69179, 69278, 79068, 79078, 79079, 79088, 79089, 79126, 79136, 79138, 79158, 79159, 79163, 79166, 79168, 79173, 79174, 79178, 79179, 79238, 79288, 80318, 80319, 80298, 80299, 80309, 80318, 80319, 80328, 80329, 80359, 179136, 179138, 179158, 179159, 179165, 179166, 179168, 179173, 179175, 179178, 179179, 179239, 179298, 179368, 179459. We also custom make all color of dial with any color stone that you have in mind. We can make exactly the way that you want it. Watchman Space is not a Rolex dealer and has no affiliation with Rolex Watch USA or Rolex SA. 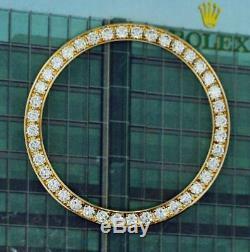 The item "Factory Lady Rolex Datejust 26mm Diamond Bezel 18K Yellow Gold Mint! #F1" is in sale since Monday, June 25, 2018. This item is in the category "Jewelry & Watches\Watches, Parts & Accessories\Wristwatches". The seller is "nbk2yoo" and is located in El Monte, California.